In the context of rehabilitation works on the Zuoz San Luzi bell tower clock and bell control system workers had told the City representatives that the tower was vibrating significantly more intense than what they were used to. (In the Engadin Valley, the church is property of the respective parish whereas the bell tower is property of the political municipality.) 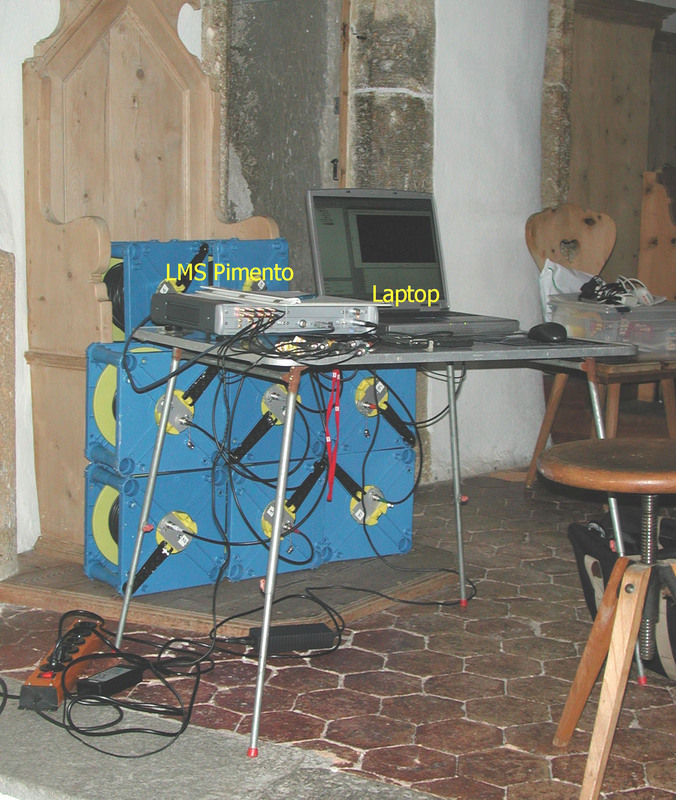 In May 2004 rci dynamics performed an experimental modal analysis under ambient excitation as well as measurements of the tower vibrations with the bells ringing (Figs. 1 to 6). The result was quite frightening: The two largest bells‘ excitation frequency (the pendulum frequency third harmonic) coincided almost exactly with the tower natural frequency in bending in the ringing direction. 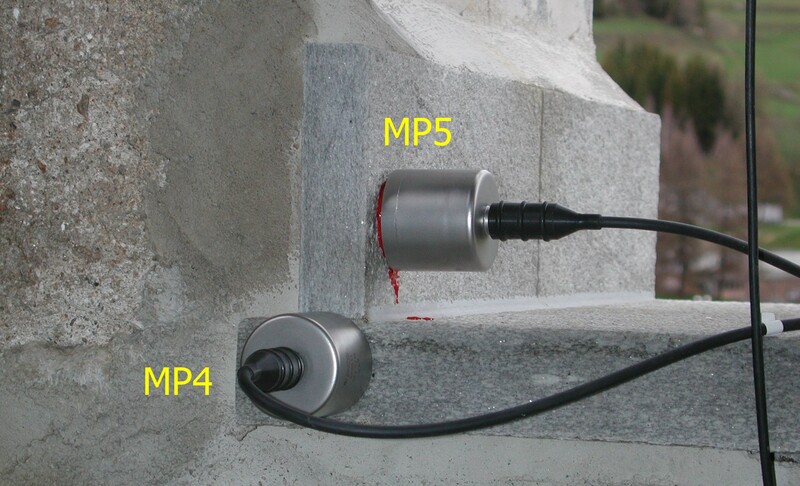 This resulted in the tower vibrational velocity being 16 mm/s which is about five times the value accepted for historical buildings in the standards. The tower foundation stems from Roman and it’s mid part from medieval times. Fig. 1: Church and Bell Tower San Luzi. Fig. 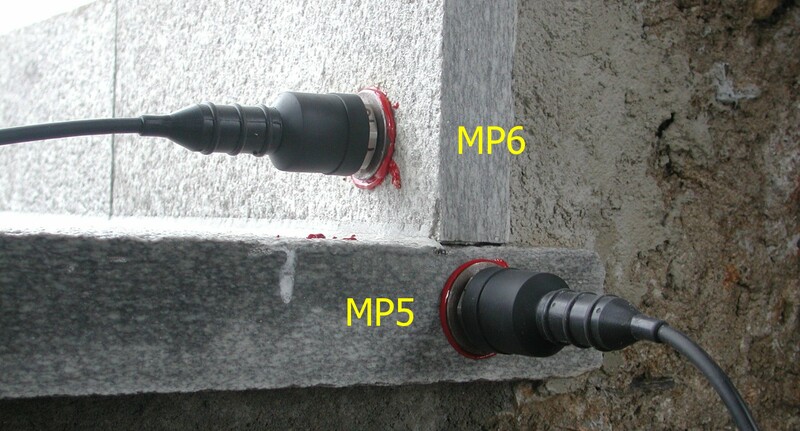 2: Sensors as used for the ambient tests. Fig. 3: Measurement of the tower vibrations during ringing the bells. Fig. 4: Measurement center in the church choir. In autumn 2008 the belfry of the two large bells was replaced and the suspension system was changed. Through cranking of the yoke axes and changing of the pendulum frequency, Rüetschi AG, Bell Forgers in Aarau, Switzerland, reduced the dynamic action of the two large bells significantly. As a result of these measures, the frequency of the first two tower modes changed slightly also. 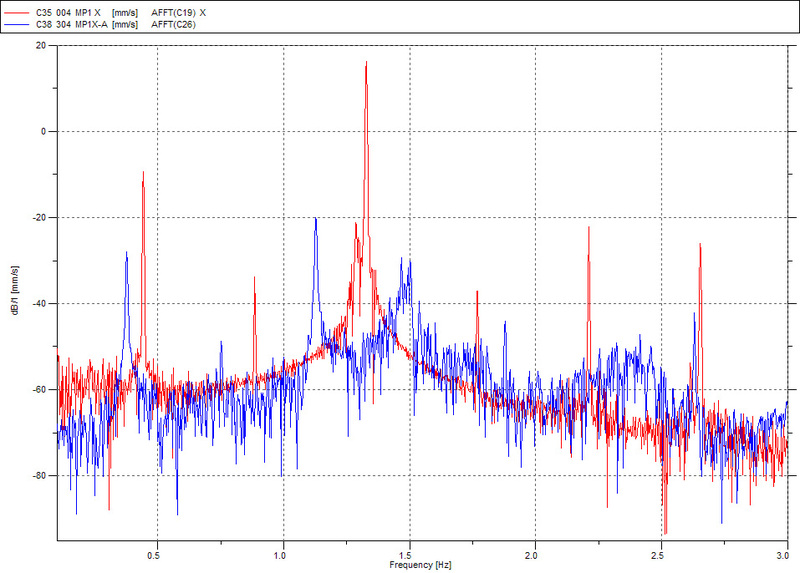 Mode 1 frequency increased from f = 1.42 Hz to f = 1.49 Hz, and mode 2 frequency increased from f = 1.78 Hz to f = 1.85 Hz. In May 2009 rci dynamics performed a similar measurement campaign as in 2004. The results showed that the measures taken by Rüetschi had a fantastic effect. The dynamic action of the two large bells, through reduction of the dynamic force amplitude (yokes) and changing of their pendulum frequency, was reduced by a factor of almost 20 (Figs. 7 to 9). The tower response to these two bells is less than 1 mm/s now. The third bell is responsible for the fact that the overall tower vibration level is still 7.8 mm/s today. No changes had been applied to the two small bells, their yokes and belfry. Fig. 5: 2004 Tower mode No. 1, f = 1.42 Hz, zeta = 1.15%. In 2009 the respective frequency was slightly higher, f = 1.49 Hz. Since the square shaped tower is partly connected to the church, it is more flexible in the ringing direction. Fig. 6: 2004 Tower Mode No. 2, f = 1.78 Hz, zeta = 1.1%. Unfortunately, it was not possible to reflect the tower’s square shape with the measurement point layout. Of course, the tower is bending across its weak axis in mode 1 and across its stiff axis in mode No.2. Fig. 7: 2004 Tower vibrational velocity with bell No. 1 (the largest) ringing. 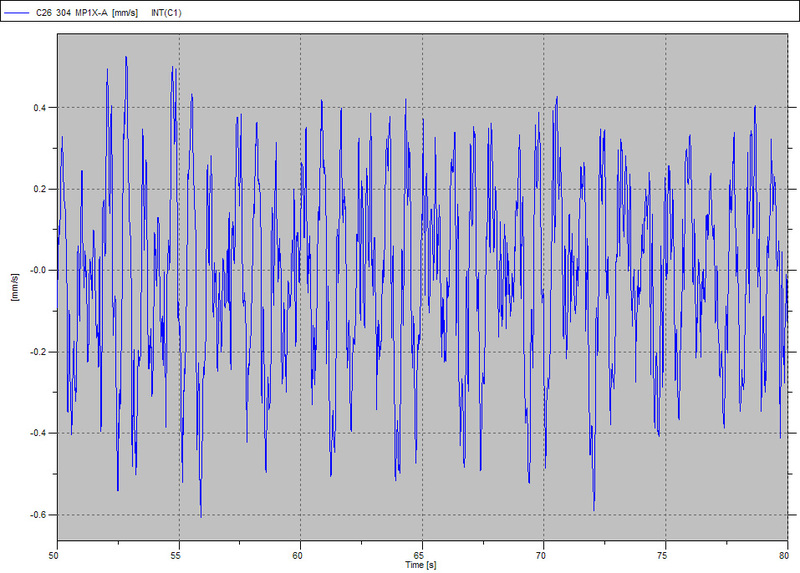 Shown is a 30-s-time window, the amplitude is about v = 11 mm/s. Fig. 8: 2009 Tower vibrational velocity with bell No. 1 (the largest) ringing. 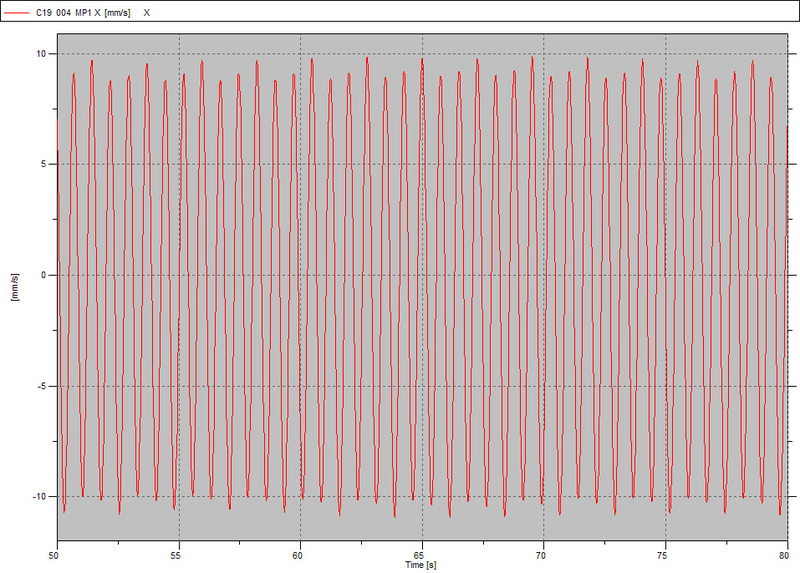 Shown is a 30-s-time window, the amplitude is about v = 0.5 mm/s. Fig. 9: The bell tower vibrational velocity frequency-spectra for ringing of bell No. 1 in 2004 (red) and in 2009 (blue). The effect of reducing the bell’s pendulum frequency and thus introducing a significant distance to the tower fundamental frequency can easily be detected.